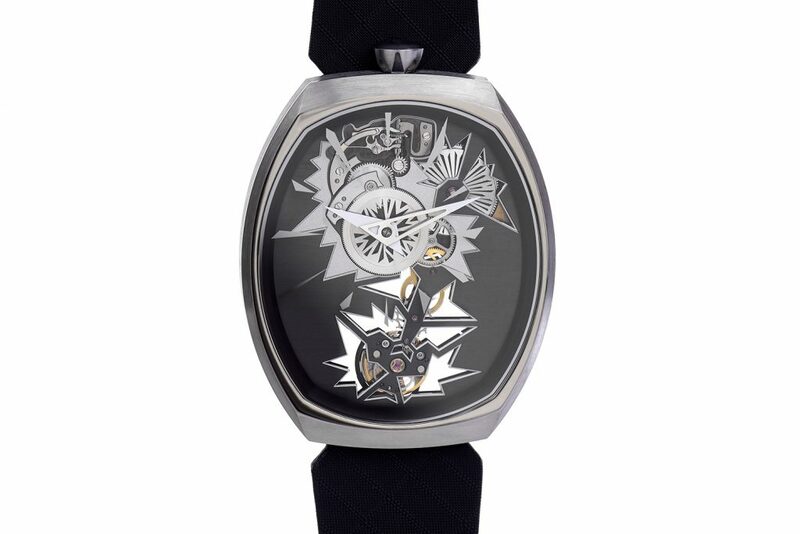 Fiona Kruger Chaos Mechanical Entropy watch features a new movement, Chaos, by Agenhor. Known for her intricate and exceptional Skull-shaped watches, Fiona Kruger could be called the queen of the skulls. 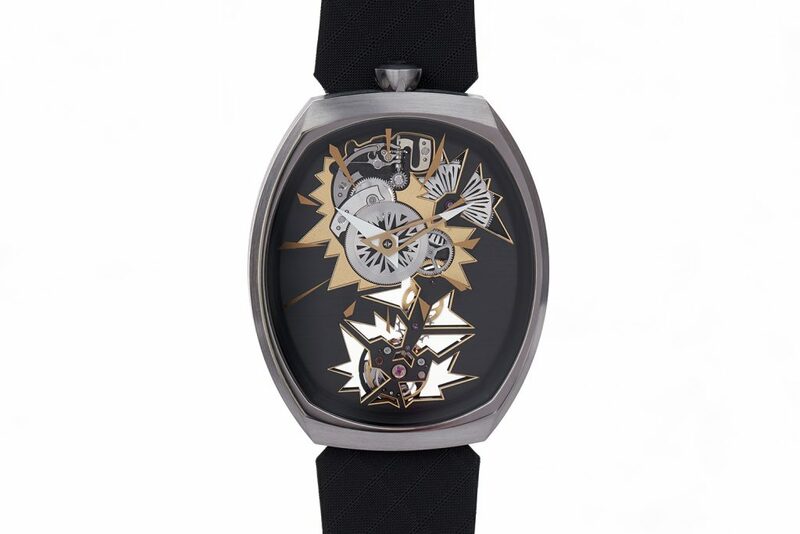 Her watches – in several sizes – attract attention from across any crowded room thanks to the colorful and detailed designs of the open-worked skull that reveals the movement within. Thanks to this collection, which has been evolving over the course of five years, many watch lovers equate skull watches with Fiona Kruger. However, today, she changes that by unveiling her second collection of timepieces: Chaos. And guess what, the line is not skull-shaped. Instead, Fiona Kruger unveils the oval timepiece that embraces the concept of skeletonization and chaotic mechanics. 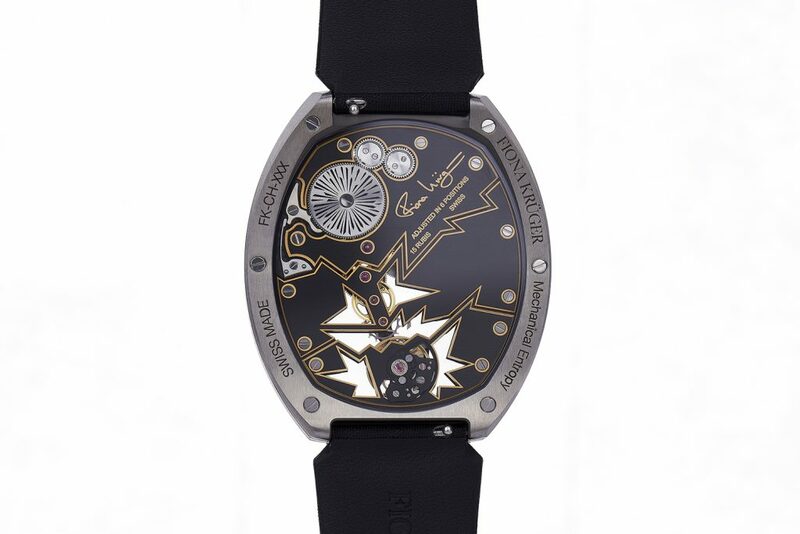 The back of the Fiona Kruger Chaos Mechanical Entropy watch. Now, if you know Fiona Kruger like I do, you know that she is incredibly enthusiastic, passionate about her designs and driven by unflagging determination. 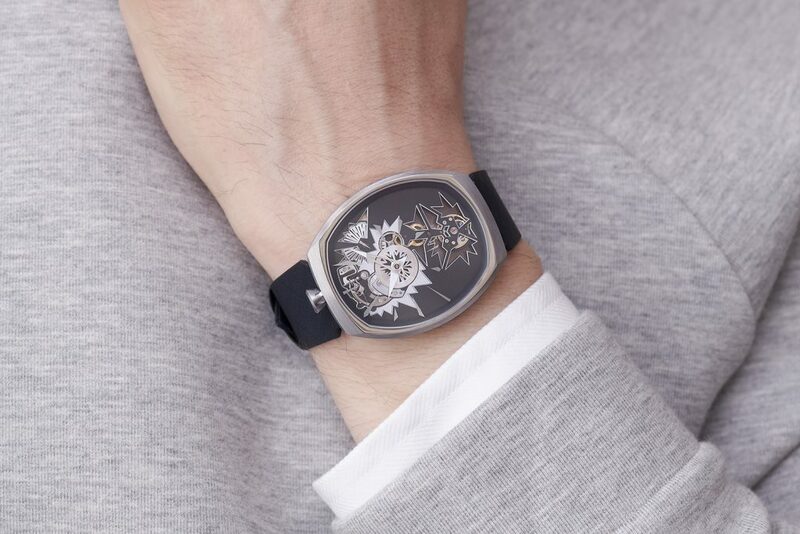 She put together her designs and concepts for this Chaos collection and discussed it at length with master watchmaker (and another good friend of mine) Jean-Marc Wiederrecht of Agenhor, well-known movement conceptualizers. Wiederrecht loved the concept, but said to properly execute it, there were a number of inherent challenges, not the least of which was making an all-new movement. 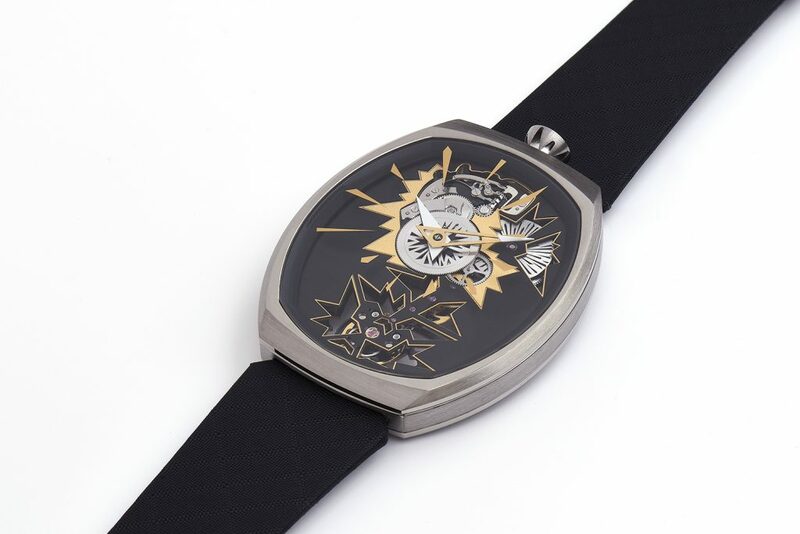 The first Fiona Kruger Chaos collection watches are the Mechanical Entropy skeleton offered in two color ways. The Fiona Kruger Chaos movement consists of a host of different processes and techniques to achieve the look Kruger wanted. Before we tackle the challenges of making this watch, let me describe it for you. Obviously, the pictures herein say a thousand words, but essentially, Kruger wanted to showcase a movement almost exploding in air – like when chaos strikes and everything explodes. This effect takes place via the dial-free, skeletonized movement that not only is elongated so the gear trains, barrel, teeth and wheels occupy the entire length of the oval case as though they are moving away from one another, but also the parts are cut and finished – framed — in such a way as to show off the dramatic shards emulating an explosion. The various “explosions” are graduated in size, building up from the bridges to the mainplate. The hour and minute wheels are off-center, and the barrel of the mainspring is visible so that as the watch is being wound, the wearer can see the barrel turning … time moving closer to that explosion. 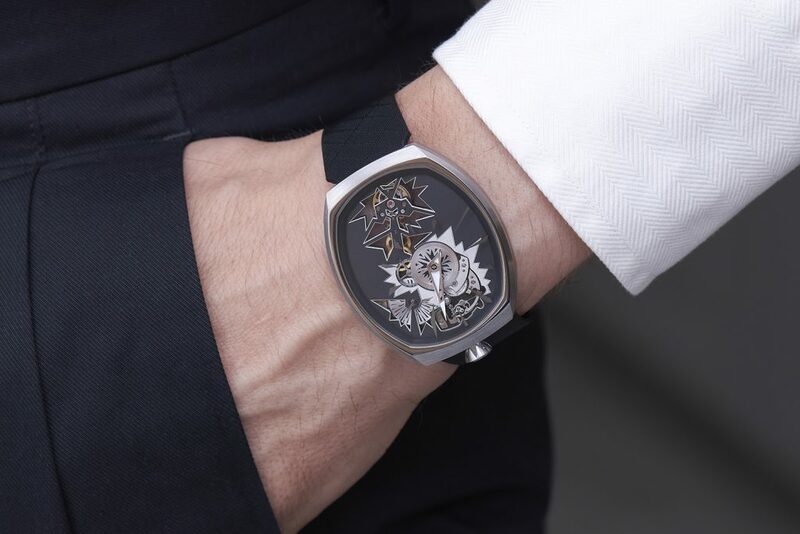 The first versions of the two-hand skeletonized Chaos movement come in the form of two Mechanical Entropy watches – one in a black and gold color theme, and the other in black and silver. Each watch retails for $29,200. The concept behind the new Fiona Kruger Chaos Mechanical Entropy watch is evident in the design. In addition to creating the technical movement to double as the artistic aesthetic, there were other challenges inherent in the production of this timepiece. The new Fiona Kruger Chaos Mechanical Entropy watch houses the Chaos movement, made by Agenhor to Kruger’s design. Movement: Mechanical Manual movement, CHAOS I, developed with Agenhor. Manual wind movement with 50 hours power reserve. The plates and bridges of the two-tone movement have a brushed finish with a black PVD coating, while the openings and the larger surface explosion on the font of the movement were created with laser technology and a galvanic colouring process in either gold or rhodium. The Chaos movement is a manual-wind two-hand skeleton movement with innovative regulating system patented by Agenhor: AgenPit. Hand-finished components, including engraved and hand-painted exploding barrel and shattering skeletonised hour wheel. Versions: black and rhodium or black and gold finishing. Indexes: Metallic fragments on the underside of the sapphire mark the hours.